Thesis (M.U.R.P)--University of Florida, 2017. Winnie the Pooh T hank you t o all those who gave me str ength along the way T hank you Jason for never letting me forge t that I can conquer anything And to my family, Kenleigh and Zac, t hank you for helping me be brave in the toughest of times. I love you all. 4 A CKNOWLEDGMENTS I would first like to thank my thesis advisor Dr. Kathryn Frank of the College of Design, Construction and Planning at the University of Florida. Professor Frank has been an advisor and mentor of mine for many years now and I am proud of the work I created with her wisdom as a guide I would also like to thank the team at USGS that allowed me to work on the Fruit Farm Creek project, especially Dr. Amanda Demopoulos. Dr. Demopoulos provided me with the opportunity to get out of my comfort zon e and learn the science behind mangrove restoration and integrate that with my own field of study. I would also like to acknowledge Michael Volk of the Department of Landscape Architecture at UF as the second reader of this thesis He provided a much neede d perspective that was very valuable to my thesis Finally, I cannot fully express the gratitude I have for my family and my boyfriend who me with unwavering support throughout this whole experience This accomplishment would not have been possible without them. Thank you. 10 Abstract of Thesis Presented to the Graduate School of the University of Florida in Partial Fulfillment of the Requirements for the M aster of Urban and Regional Planning SUSTAINABILITY OF ECOLOGICAL RESTORATION PROJECTS: A CASE STUDY OF FRUIT FARM CREEK MANGROVE RESTORATION By Kris tin Buckingham December 2017 Chair: Kathryn Frank Cochair: Michael Volk Major: Urban and Regional Planning Mangrove ecosystems benefit both the organisms that depend on the habitat and the humans that enjoy and affect them. Despite the benefits, mangrov es are continually degraded and destroyed for short term economic benefit. The field of restoration ecology is attempting to reverse that trend and restore precious natural landscapes, like mangrove ecosystems. This research is investigating how restoratio n projects can be designed in a sustainable way and why this is important for the long term success of the efforts. Economic, ecological, and social aspects of restoration projects are explored to find best practices that can be applied to real projects. T hese concepts are used to analyze the Fruit Farm Creek Mangrove Restoration Project and identify successes and/or challenges. While the project has a sound, science driven ecological restoration plan, the biggest challenge is funding. Based on the findings recommendations are made to potentially increase the long term sustainability of the restoration. Efforts that will have the biggest impact include increasing public involvement and stewardship, tapping into the partnership with Rookery Bay NERR, documen ting the process, sharing the results, and exploring alternative funding resources. 11 CHAPTER 1 INTRODUCTION In a world where the environment is so closely tied to the urban landscape, there is a constant struggle to protect the environment while allowing f or human growth. Often we see that one may come at the expense of the other; the environment is degraded in the face of urban growth or human contact is ultimately restricted from the environment in order to protect it, with the former being the dominant t rend. One environment being heavily degraded by human disturbance is mangrove forests. Current Situation There are currently roughly 181,000 km of mangroves along various coastlines, with 9 orders, 20 families, 27 genera, and roughly 70 different species of mangroves (Alongi, 2002; Ellison, 2000). According to Lewis (2001), the larger coastal ecosystem typically includes mud flats, seagrass meadows, tidal marshes, salt barrens, coastal upland forests and freshwater wetlands, freshwater streams and rivers, and even coral reefs in some tropical climates. The benefits of these ecosystems are numerous to both the organisms found in the ecosystem and the humans that enjoy and affect them. Healthy mangrove habitat supports many species of fish and various wildli fe including birds, reptiles, and other mammals (Alongi, 2002). Mangrove forests have the ability to trap sediment, contaminants, nutrients and carbon, which in turn helps to clarify the water (Alongi, 2002). Some ways that these forests directly benefit h umans include food/resource production and commerce, community enjoyment and recreation, conservation of natural land, increasing water quality, and protection of coastal communities through soil stabilization and buffering against wind and storm surge. 16 restoration and ways to improve economic sustainability. The ecological portion will cover the widely accepted procedures of ecological restoration including setting goals, prioritizing goals and restoration techniques, establishing success criteria, and sharing successes and failures. The social aspects of ecological restoration will include the benefits of participation and a framework for successful participation in a project. Finally, there will be a brief overview of the threat of climat e change to mangroves and the potential for coastal ecosystems to mitigate climate change. The methodology contains the research design and techniques used in the study. This study will follow a qualitative research design with a case study approach. The case study will be the Fruit Farm Creek Mangrove Restoration Project. In addition, the data analysis and tools used will be discussed, along with the limitations of the methods. The primary source of data will be obtained from document collection. The info rmation will follow the major themes of sustainability, as it pertains to the restoration project. Other possible types of data include on site observations and interviews. This chapter will contain an analysis of the Fruit Farm Creek Mangrove Restoration Project. It will begin with an overview of the project. More specifically, it will examine background information, the restoration plan, USGS involvement, funding, and partnerships. This chapter will begin with a discussion about the benefits and current progress of the Fruit Farm Creek project. Then there will be a discussion about the analysis of the economic, ecological, and social aspects of the project. Finally, the chapter will include recommendations about how to increase the sustainability and over all success of the project. 17 The final chapter of the thesis will be the conclusion, which will summarize the findings, reiterate the suggestions for increasing the sustainability of the project, and outline possible areas of further research. 18 CHAPTER 2 LITERATURE REVIEW The definition of ecological restoration has evolved over time, as lessons learned and undesirable outcomes have guided the re evaluation of the ultimate goal of restoration. The gradual change over time displays an advancement in how res toration ecology is approached and it is important to identify the current practices of the field. Traditionally, the aim of ER has been to restore a lands cape back to its historical vegetation (Wyant, Meganck, & Ham, 1995) Si nce then, ecologists have found that the historic state of the ecosystem is not necessarily desirable or achievable today (Wyant, Meganck, & Ham, 1995) Wyant, et al. (1995) combined multiple definitions to conclude that ER sho ecosystem values, goods, and services, as determined through a number of scientific and public input mechanisms; (2) identification of the functional and structural elements essent ial to a self sustaining system that will provide those values; and finally, (3) facilitation of ecosystem recovery to a self sustaining state by manipulation of the Withi n this definition are important rationales used to guide this research. For instance, emphasize the need for including social inputs in a project. It does however lack any mention of resilience and simply mentions the system should be self sustaining. As threats to ecosystems become more prevalent, it is increasingly important to understand how ecosystems increase resilience and how land management can improve those odd s.
19 The benefits of ER are numerous, including, but certainly not limited to, increasing biodiversity, reestablishing ecosystem services, sustaining livelihoods, and improving well being both materially and culturally (Aronson, Cl ewell, Blignaut, & Milton, 2006) More detai led benefits are listed in Figure 2 1 Recognizing the benefits of ER provides a basis for gathering support for a project. To gather public and stakeholder support, as well as funding, people need to understan d why the ecosystem is important and what can be lost if restoration does not occur. These concepts are discussed further in this chapter. Throughout this literature review, the various aspects of the emerging field of restoration ecology will be examined, specifically as they relate to the three pillars of sustainability. This will involve searching the literature for best practices in gathering economic resources, designing ecological restoration plans, and increasing social involvement. This knowledge wi ll guide the recommendations for increasing the sustainability and success of the Fruit Farm Creek project. But first, a number of ecological restoration projects are identified, which used a sustainable design approach. These cases were examined in order to get a sense of how sustainability was woven into the project and increased the success. 22 some may need to be altered to fit within the context of the project. Alternatively, it allows for faulty practices to be avoided, which saves precious time and resources. Collaboration with other pr ojects and studies has also been shown to increase the sustainability of ecological restoration projects. An example is the Earth Partnership program at the Univers ity of Wisconsin Madison. The program helps to get kids involved in restoration projects t o help them that is relevant to their everyday lives (Bauer Armstrong, 2016) One project the program was involved with is the Kinnickinnic River restoration, the seventh most endangered river in the U.S. due to pollution and low water levels. Involving the students allows them to learn more about the process of restoration and the ecological issues while creating a bond with nature and other likeminded individuals. Another example is fou nd in the Living Breakwaters project, where the team identified multiple programs, like the Billion Oyster Project, and other state and federal initiatives that could become partners (Rebuild by Design, n.d.) This extended the a mount of actions. When looking at the implementation of a project, one way to increase the potential for success is to identify key elements of successful implementati on. This was clearly evident in the Living Breakwaters project. The project identified four key elements including community and agency input, coalition building, a robust regulatory strategy, and strong funding justification (Rebu ild by Design, n.d.) While the specific elements will vary for each project, the identification of the elements provides a path for identifying proper steps to take and accountability for completing each step or task. 27 included testimony from local residents (example shown in Figure 2 2 ), committee members, agency partners, and even included received letters of sup p ort. Figure 2 2. Example of testimony included in a project proposal (Rebuild by Design, n.d.) Finally, a theme present in all successful restoration proje cts was the use of expertise. In many cases, ecological restoration is highly technical and require s a certain level of expertise to properly restore the damaged ecosystem, whether it be restoring the hydrology of mangroves or remediating toxic pollution in a waterbody. One project that required a high level of expertise was the Quarry Garden in Shangha i. The complexity of the site conditions required the use of highly difficult construction techniques (American Society of Landscape Architects Quarry Garden, n.d.). It is also important to realize that when the site poses many challenges the design and construction may need to be altered as new problems are presented. When expertise is overlooked it will most likely result in project failure to some degree. In mangrove restoration specifically, the process is complex and should be founded on known princi ples of ecosystem restoration and management (Blum & Herr, 2017) ast paced and large (Blum & Herr, 2017) which leads to low long term survival, as seen in the Philippians. 40 2002). Attribute a nalysis uses the list of nine attributes, explained above, and evaluates parameters based on each of the nine goals. Trajectory analysis is still under development. This strategy interprets large sets of comparative data, which is collected periodically to establish trends. The restoration will follow its intended trajectory if the trends move toward the reference conditions. Each of these strategies is intended to assess the ecological progress of the project, but other tools will need to be identified in order to evaluate any cultural, economic or other societal goals and objectives. Finally, across the literature, it shows there is a need for documentation of successes and failures, as well as generally accepted criteria for measuring success. This is es pecially true for mangrove restoration projects. When projects fail, there is little documentation as to why, increasing the opportunity for upcoming projects to make the same mistakes (Lewis R. R., 2001) A better way to disse minate this information is needed to act more effectively and increase cost effectiveness of projects. Information should be spread to a larger audience, including international forums and politicians/policy makers (Lewis R. R., 2001) Each step listed in this s ection is summarized in Figure 2 4 which shows a flow of the ecological restoration process (Hobbs & Harris, 2001) Viewers can clearly visualize the process from data collection, to choosing techniques, to monitoring and evaluation. The figure also shows the importance of recognizing outside influences, like societal goals and policy instruments, and adaptation to close the system. 42 Reed (2008) shows many examples of stakeholder participation improving the strongly dependent on the quality of the involve stakeholders in a project, it becomes a matter of who to involve, when to involve them, and how to involve them. Each of the questions will be explored throughout this section. Benefits of Participation Th ere are many benefits of stakeholder participation, which can be broken down into two categories: normative and pragmatic. Benefits for democratic society, citizenship and equity all fall under normative claims (Reed, 2008) An example is the ability to include members of society that are normally marginalized to promote active citizenship and benefit the wider society. The equitable inclusion of stakeholders promotes decisions that are more holistic and fair. These actions may serve to increase public trust in the decisions that are made. Involving these stakeholders also provides the opportunity for social learning, in which relationships are developed to provide an avenue for co learning, trust building, and seeing others poin ts of view (Reed, 2008) Principles like the quality and durability of decisions make up the pragmatic claims (Reed, 2008) For instance, it has been argued that interventions and technology are mo re easily adopted in the local context through stakeholder participation. Also, the inclusion of stakeholders can increase the quality of research and other inputs. If applied in the early stages of the project, the likelihood of success is increased becau se each step is more informed from the project design, to the gathering of information, to the priorities set, and to the decisions made (Reed, 2008) Furthermore, inclusion may lead to a sense of ownership, which should influe nce more sustainable outcomes. 43 While there are many potential benefits of stakeholder participation, there is growing concern that actual implantation does not live up to the claims (Reed, 2008) One major concern is the failu re to identify and include some stakeholders, which can introduce bias in the project (Luyet, Schlaepfer, Parlange, & Buttler, 2012) Additionally, if participatory processes are poorly run and techniques provide minimal outcom es, it can lead to fatigue and people can become disinterested in participating. The credibility of stakeholders has also been questioned if it is perceived that their expertise is not sufficient (Reed, 2008) All in all, there is little evidence of the validity of these claims because evaluations tend to focus on the process instead of the outcomes of increased stakeholder participation (Reed, 2008) This should not discourage the participation of s takeholders in a project, but instead should highlight potential problems so actions can be identified in order to eradicate them. Framework for Participation Recently, there has been a shift in the ideology of how to approach participation. process based approach to participation (Reed, 2008) This method focuses on participation as a long term collaboration of people who use the toolki t to negotiate potential decisions. This section explains a framework for sta keholder participation (Figure 2 5 ), developed by Luyet, Schlaepfer, Parlange & Buttler (2012), which explores each stage of the process. 45 by the decision, (2) identifying individuals or groups affected by or that can affect those aspects and (3) prioritizing the involvement of the individuals or groups (Reed, 2008) It is essential to identify a process that will allow for the equitable inclusion of stakeholders. The technique(s) used to identify stakeholders will d epend on the project context, the project phase and the available resources (Luyet, Schlaepfer, Parlange, & Buttler, 2012) There are several techniques identified in the literature. It can be done based on proximity, social va lues, urgency, and legitimacy. Some choose to differentiate between stakeholders with an economic interest or those motivated by principles (Luyet, Schlaepfer, Parlange, & Buttler, 2012) The snowball technique includes a form of brainstorming to identify stakeholders. And there are many more. But, as mentioned, the technique used should result in a collection of all stakeholders. In doing so, the complexity and cost may become too much, so finding the balance is necessary. Cha racterization of stakeholders can be done to understand the relationship of (Luyet, Schlaepfer, Parlange, & Buttler, 2012) Identifying power structures can decrease the like lihood of weaker stakeholders being discriminated against. However, this step can be optional for small scale projects or where the number of stakeholders is limited. Characterization includes criteria like attitudes, potential conflicts and coalitions, in terest, access to resources, political influence, degree of implication, power, urgency, legitimacy, and scale of influence (Luyet, Schlaepfer, Parlange, & Buttler, 2012) Another useful tool is to draw stakeholder maps to show links and relationships. 50 The Basics of Mangrove Restoration and Climate Change Threats of Climate Changes Some of the impacts of cl imate change that can threaten mangroves include rising sea levels, strong storms, and changes in precipitation and temperature. Sea levels can rise by expanding ocean water and melting of mountain glaciers and ice caps (NASA, 20 17) While changes will vary by region, global sea levels are projected to rise 1 to 4 feet by 2100 (NASA, 2017) Climate change impacts are interwoven together, where a change in one will affect all others. Local changes in sea levels depend on many other variables like changes in wind, currents, salinity, and temperature. Mangroves are sensitive to changes in inundation duration and frequency, as well as changes in salinity. Local variations of land subsidence and lift will also affect mangroves adaptability to sea level rise. According to Ward, Friess, Day & MacKenzie (2016), mangroves in micro tidal areas are located at lower elevations and therefore at a greater risk to sea level rise. Changes in storminess are less certai n than predictions of sea level rise and temperature, but changes will vary by season and region. Globally, the intensity of winds from tropical storms is likely to increase (NASA, 2017) North Atlantic hurricanes are likely to become more intense and frequent as the waters get warmer. Unlike sea level rise, intense storms can be both destructive and constructive to mangroves (Ward, Friess, Day, & MacKenzie, 2016) Storms can be destructive because o f intense wave action and wind. Fringe mangroves will be most affected and in the worst case a large scale loss of mangroves can result in peat collapse and decrease in soil elevation. This would decrease resiliency against sea level rise and increase the chances of further erosion. 54 Figure 2 8 Showing seagrass meadows capacity for climate change mitigation and adaptation. Blue arrows show transport of atmospheric or dissolved material. Red arrows show transport of particulates. P urple arrows show vegetation growth (Duarte, Losada, Hendriks, Mazarrasa, & Marba, 2013) Figure 2 9 Showing salt marshes capacity for climate change mitigation and adaptation. 55 Figure 2 10 Showing mangrove forests capacit y for climate change mitigation and adaptation. 58 restoration), RBNERR, USGS (data collection and analysis), Ten Thousand Islands NWR, and the local community. My access to the project came through an internship followed by a contractor position with USGS, under the supervision of Amanda Demopoulos. The steps to gaining proper access at USGS included a background check and various steps necessary to becoming a contractor. There were two site visits during the time of employment, one in July 2016 a nd in January 2017. Making the site visits possible required collaboration with RBNERR, since the sites and lab are under their purview. Logistics included working with Rookery Bay to have physical access to the lab and various tools needed in the lab, a p lace to store the samples collected, housing for the team, volunteer help from Rookery Bay, and having access to the sites during the day. Funding for the site visits was acquired through the USGS Environments Program. More detailed information about the f unding for the whole project will be described in the Data Chapter. In collecting data, the documents were gathered with the purpose of answering the research questions and objectives listed in the introduction, following the major themes of social, econom ic, environmental, and overall sustainability. To increase understanding of social sustainability, visual or written records of public meetings were analyzed, along with reviewing the website(s) for any public outreach. For economic sustainability, informa tion was gathered from project reports and relevant websites. Environmental sustainability content included project progress reports published by Coastal Resources Group and any relevant USGS reports detailing metrics used for evaluating success and curren t progress of the sites. Observations made while on site during the two visits provided some insight into social and environmental sustainability. 60 because he is located out of town. A list of questions would be sent via e mail for response but a phone call would be more casual to allow for the conversation to flow naturally. In the end, interviews were not needed for this research. Limi tations As with all types of research designs, there are certain limitations found in a qualitative design. The nature of qualitative research is emergent so it is important for the researcher to explore how any biases or values may shape the direction of the study (Creswell, 2013) In this case, the biggest challenge will be to find enough data. The direction of the case study, such as construction phases and site visits, are set in advance and cannot be biased by this research p roject. According to Creswell (2013), there are other limitations to be aware of when collecting data. In interviews, the information is likely gathered in a place other than the natural field setting and not all people are equally perceptive. Also, the p resence of the research may bias the testimony of the interviewee. For this project, gaining access to the desired interviewees may be difficult as Amanda Demopoulos and Roy Lewis are both extremely busy. When gathering documents, some information may be p rotected and unavailable to the public. It can also be time consuming for the researcher to search out some documents, as well as transcribe the information for computer entry. Finally, some materials may be incomplete or inaccurate so it is important to h ave steps in place check the validity. For audio visual materials, it also may be difficult to access the materials and/or interpret the material. 62 CHAPTER 4 DATA This chapter will contain an analysis of the Fruit Farm Cree k Mangrove Restoration Project. The economic, ecological, and social aspects will be analyzed in order to assess the sustainability of the project. This information will include an overview of the project, discussing background information, the restoration plan and other information about USGS involvement, funding, and partnerships. Figure 4 1. Reference Map showing the Fruit Farm Creek Site location along SR 92, RBNERR, surrounding cities, and Collier County (created by Kristin Buckingham). 63 Fruit Farm Creek Project Background Information The Fruit Farm Creek Mangrove Restoration project area is located in Collier County along SR 92 between Marco Island and Goodland shown in Figure 4 1 (Coastal Resources Group, Inc., 2011) The project area is located within the larger RBNERR, which is approximately 110,000 acres of mixed coastal uplands and wetlands located in Naples, Florida. Fruit Farm Creek makes up an area of approximately 250 acres of dead, dying, or severely stressed mangroves and is part of a much larger estuary. There are a number of stress indicators, including aerial roots growing on the trunks of large black mangroves, accumulations of elemental sulfur and sulfur reducing bacteria, adventitious roots growing on bl ack mangrove pneumatophores (an aerial root) (Coastal Resources Group, Inc., 2011) Within the project area there are three visible die off areas, which total 64 acres of the total area (250 acres); die off Area #1 is 4 acres t o the north of SR 92, Area #2 is 50 acres and Area #3 is 10 acres, both to the south of the road (shown in Figures 4 3, 4 4, and 4 5 ). While these die off areas are characterized by dead trees, the surrounding area, an additional 800 acres, is impaired due to a lack of connectivity and if left alone could result in an expansion of the dead zones. Altogether, this means a total area of 1,025 acres of impacted mangrove forest, including all the flora and fauna that exist there, can benefit from the hydrologic restoration project (Lewis III, 2013) The cause of the degradation can be linked to the construction of SR 92 in 1938, which cut off the hydrologic connection and tidal flow to the mangrove system (Coastal Resources Group, Inc., 2011) Field investigations were conducted in 2010 by the Coastal Resources Group to determine the exact cause of the degradation, including topographic surveys, hydrologic data collection, and documentation of historic changes. 67 among other steps. Field investigations took place from August to October of 2010. The full list of inventory and project design tasks is listed below (Lewis III, 2013) : 1. 2. hydrologic modeling, and historical change detection, and prepar e maps and 3. 4. ederal Dredge and Fill permit application to the South Florida Water Management 5. 6. s and respond to requests for additional information (RAIs) through the issuance of the ERP and Federal 7. site for interested stakeholders, age ncy personnel and RBNERR 8. and/or universities in an on going program to develop hands on capabilities in restoration project design, implementation and monitoring for the l ife of the 9. 10. 11. 12. 13. 14. 70 Figure 4 6. Fruit Farm Creek Mangrove Restoration In formation and Plan. Figure used to briefly explain the project and its elements, as well as give some visual reference of some of the issues. 75 2013) The Restoration Team and Steering Committee worked together to confirm the project goals and o utline the roles of each partner/stakeholder. 76 CHAPTER 5 DISCUSSION This purpose of this chapter is to discuss the sustainability of the Fruit Farm Creek project in more detail and identify possible ways to increase sustainability. It will begin by descr ibing the project benefits and current progress documented in the latest progress reports. Again, understanding the benefits of the project is an essential step in gaining support for the project. Then the economic, ecological, and social challenges and st rategies for improvement are identified. Project Benefits Several benefits are outlined in various articles, funding applications, and reports about the project. General information about the positive impacts of mangrove restoration has been outlined in t he literature review and is applicable to this project as well. This habitat provides a crucial nursery for a number of species that have commercial and recreational importance (Lewis III, 2013) Some such species include th e endangered smalltooth sawfish, and others like snook, mangrove snapper, stone crab, oysters, and more, which all have commercial value. Mangroves also provide important foraging and roosting areas for many bird species that draw tourists to Florida every year, like the roseate spoonbill, great blue heron, snowy egret, and more. Furthermore, it is presented that mangrove restoration will enhance the resiliency of the community (Lewis III, n.d.) By improving the hydrology, the estuary has a better ability to adapt to rising water and sea level rise. Once the hydrology of the area is restored and the health of the mangroves improves, this allows for natural increases in soil and plant elevations over time. 82 adaptation initiatives and programs may also provide a great funding opportunity for the project, especially following the recent Hurricane Irma. Ecological The outlook from the ecolog ical point of view is a more positive one. This project does a great job of identifying actions that benefit the whole ecosystem, not just the degraded mangrove trees. The progress reports from Zysko, Worley, and Lewis, as well as the USGS findings, show t hat even though the project is at a standstill, the restoration efforts completed are working. The project has the unique opportunity to report about the effectiveness of hydrology only restoration and the EMR approach. As shown in the literature review, h istorically there has been a misconception that planting seedlings is necessary in mangrove restoration projects. But recent literature has shown that method is often most costly due to the low level of success. The ability of the project to remain releva nt relies on funding and the continual assessment and adjustment when necessary. Looking back at Figures 2 and 3, both models include monitoring/evaluation and adaptation in the ecological restoration process. It is essential to monitor the progress and ma ke changes when progress is slowing or reversing. Another step presented Figure 2, the model by Bosire, et al. (2008), is to give recommendations for improved site management. Relaying the findings to RBNERR would help to increase the ecological sustainabi lity of the Fruit Farm Creek site but also the entire reserve. The ability of the reserve to make well informed decisions, moves beyond the science and results in actions that enhance the management of a large and important natural area. 85 a great impact on the management of Rookery Bay NERR. These concepts are applicable to the management plan and accompanying initiatives, as well as various projects located within the reserve. Rookery Bay has a great opportunity to partner wi th projects that apply sustainable design, which can only contribute the long term health of the natural resources within the reserve. In the case of the Fruit Farm Creek project, the resources of Rookery Bay vastly increase the chances of success for the project, if fully utilized. This will take interest and willingness of the reserve to identify opportunities that can benefit the project, some of which were discussed above. 87 practices is not repeated, which has historicall y been the case. Collaboration across disciplines and expertise, and involving the public plays a role in the success of the project. Exploring different opportunities with stakeholders and the public contributes to the awareness and interest of the projec t The concepts discovered in this research offer exciting opportunities for management of Rookery Bay NERR. There is much to learn from the Fruit Farm Creek project, as well as other ecological restoration projects, especially when concerned about climate change and adapting to sea level rise. This study, along with the USGS study, can inform future research about how healthy mangrove ecosystems can adapt to sea level rise and increase community resiliency. 88 LIST OF REFERENCES Alongi, D. M. (2002). Present state and future of the world's mangrove forests. Environmental Conservation, 29 (3), 331 349. American Society of Landscape Architects (n.d.). Quarry Garden in Shanghai Botancial Garden Retrieved from General Design: 2012 ASLA Projec tssional Awards: https://www.asla.org/2012awards/139.html American Society of Landscape Architects. (n.d.). ChonGae Canal Point Source Park Retrieved from Designing Our Future: Sustainable Landscapes: https://www.asla.org/sustainablelandscapes/pdfs/ChonGa ePark_Fact_Sheet.pdf American Society of Landscape Architects Inc. (2017). Transformative Water Retrieved from Designing Our Future: Sustainable Landscapes: https://www.asla.org/sustainablelandscapes/pdfs/Transformative_Water_Fact_S heet.pdf Aronson, J., C lewell, A., Blignaut, J., & Milton, S. (2006). Ecological restoration: A new frontier for nature conservation and economics. Journal for Nature Conservation 135 139. Bauer Armstrong, C. (2016, June 8). Education through Ecological Restoration: Earth Partn ership Engages Youth as Environmental Stewards Retrieved from Green Schools National Network: https://greenschoolsnationalnetwork.org/education ecological restoration earth partnership engages youth environmental stewards/?gclid=Cj0KCQjwx8fOBRD7ARIsAPVq N m6q0aEoURBxpB3xHGM6LjBfCd5G5FuojNOpOgPiTqbgGNoa1sDbFgaAqtkE ALw_wcB Baxter, P., & Jack, S. (2008). Qualitative case study methodology: Study design and implementation for novice researchers. The Qualitative Report, 13 (4), 544 559. Beierle, T. C. (1998). Pub lic Participation in Environmental Decisions: An Evaluation Framework Using Social Goals. Washington, DC: Resources for the Future. Blignaut, J., Aronson, J., & de Groot, R. (2013). Restoration of natural capital: A key strategy on the path to sustainabili ty. Ecological Engineering 54 61. Blum, J., & Herr, D. (2017, February 21). Mass mangrove restoration: Driven by good intentions but offering limited results Retrieved from IUCN: https://www.iucn.org/news/forests/201702/mass mangrove restoration driven g ood intentions offering limited results Bosire, J. O., Dahbouh Guebas, F., Walton, M., Crona, B., Lewis, R., Field, C., & Koedam, N. (2008). Functionality of restored mangroves: a review. Aquatic Botany, 89 (2), 251 259. 89 Cahoon, D. R., & Lynch, J. (2010, Ju ne 23). Surface Elevation Table (SET) Retrieved from Patuxent Wildlife Research Center: https://www.pwrc.usgs.gov/set/ Choi, Y. D., Temperton, V. M., Allen, E. B., Grootjans, A. P., Halassy, M., Hobbs, R. J., . Torok, K. (2008). Ecological restoration for future sustainability in a changing environment. Ecoscience 53 64. Coastal Resources Group, Inc. (n.d.). Fruit Farm Creek Retrieved April 24, 2017, from Saving the Mangroves on the Edge of Marco Island & Goodland: http://www.marcomangroves.com Coast al Resources Group, Inc. (2011). Fruit Farm Creek Mangrove Restoration Project Joint SFWMD ERP/USACE Dredge & Fill Permit Envronmental Suppliment. 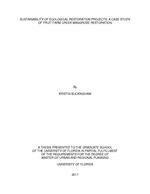 Punta Gorda: The Ecology Group, Inc. Cohen, D., & Crabtree, B. (2006, July). Quanlitative Research Guidelines Project Retrieved from http://www.qualres.org/HomeCase 3591.html Creswell, J. W. (2013). Research Design: Qualitative, Quantitative, and Mixed Methods Approaches. Thousand Oaks: Sage Productions Inc. Demopoulos, A. W., & Krauss, K. W. (2016). Assessing t he FUnctional Equivalency of Mangrove Restoration Projects in Southwest Florida. Demopoulos, A. W., Bourque, J. R., McClain Counts, J., Cormier, N., & Krauss, K. (n.d.). Assessment of Recovery of Mangrove Habitats Using Stable Isotopes. Duarte, C. M., Lo sada, I., Hendriks, I., Mazarrasa, I., & Marba, N. (2013). The role of coastal plant communities for climate change mitigation and adaptation. Nature Climate Change 961 968. Ellison, A. M. (2000). Mangrove Restoration: do we know enough? Restoration Ecolo gy, 8 (3), 219 229. EPA. (n.d.). Future Climate Change Retrieved August 10, 2016, from https://www3.epa.gov/climatechange/science/future.html#sealevel Gilman, E., & Ellison, J. (2007). Efficacy of Alternative Low cost approaches to Mangrove Restoration, Am erican Samoa. Estuaries and Coasts 641 651. GIS Planning Inc. (2017). Community Profile Retrieved from ZoomProspector: https://www.zoomprospector.com/communities/fl/city/marco island/1243083 Gulf Coast Ecosystem Restoration Council. (n.d.). About the RES TORE Act Retrieved from restorethefulf.gov: https://www.restorethegulf.gov/history/about restore act Hobbs, R. J., & Harris, J. A. (2001). Restoration Ecology: Repairing the Earth's Ecosystems in the New Millennium Restoration Ecology 239 246. 90 Hobbs, R J., & Norton, D. A. (1996). Towards a conceptual framework for restoration ecology. Restoration Ecology 93 110. Kairo, J. G., Dahdouh Guebas, F., Bosire, J., & Koedam, N. (2001). Restoration and management of mangrove systems a lesson for and fro mthe East African region. South African Journal of Botany 383 389. Kamali, B., & Hashim, R. (2011). Mangrove restoration without planting. Ecological Engineering 387 391. Krauss, K. W., Cormier, N., & Demopoulos, A. W. (2013). Using a functional equivalency a pproach to assess hydrological restoration of a mangrove forest in southwest florida. Kumar, R. (2011). Research Methodology: a step by step guide for beginners. Thousand Oaks: SAGE Publications Inc. Lewis III, R. R. (2009). Coastal Wetlands: An Integrated Ecosystem Approach. Elsevier B. V. Lewis III, R. R. (2013). Supplemental RESTORE Act Information for the Proposed Fruit Farm Creek Mangrove Restoration Project. Coastal Resources Group. Lewis III, R. R. (n.d.). Project Name: Fruit Farm Creek Mangrove Rest oration Project Retrieved from Collier County: http://www.colliergov.net/home/showdocument?id=47780 Lewis, R. R. (2001). Mangrove restoration Costs and benefits of successful ecological restoration. Mangrove Valuation Workshop. Penang: Universiti Sains M alaysia. Lewis, R. R. (2005). Ecological engineering for successful management and restoration of mangrove forests. Ecological Engineering 403 418. Luyet, V., Schlaepfer, R., Parlange, M., & Buttler, A. (2012). A framework to implement Stakeholder partici pation in environmental projects. Journal of Environmental Management 213 219. Miller Rushing, A., Primack, R., & Bonney, R. (2012). The history of public participation in ecological research. Frontiers in Ecology and the Environment 285 290. NASA. (2017 October 17). The consequences of climate change Retrieved from Global Climate Change Vital Signs of the Planet: https://climate.nasa.gov/effects/ Osland, M., Spivak, A., Nestlerode, J., Lessmann, J., Alejandro, A., Heitmuller, P., . Stagg, C. (2012) Ecosystem Development After Mangrove Wetland Creation: Plant Soil Change Across a 20 Year Chronosequence. Ecosystems 848 866. 91 Primavera, J. H., & Esteban, J. M. (2008). A review of mangrove rehabilitation in the Philippines: successes, failures and futu re prospects. Wetlands Ecology and Management 345 358. Rebuild by Design. (n.d.). Living Breakwaters Retrieved from http://www.rebuildbydesign.org/data/files/676.pdf Reed, M. S. (2008). Stakeholder participation for environmental management: A literature review. Biological Conservation 2417 2431. Ruiz Jaen, M. C., & Aide, T. M. (2005). Restoration Success: How Is It Being Measured. Restoration Ecology SCAPE. (n.d.). Ecologcial Design, Public Engagement, Waterfront/Resiliency Retrieved from Living Break waters Rebuild By Design Competition: http://www.scapestudio.com/projects/living breakwaters competition/ Silvius, A., & Schipper, R. (2010). A Maturity Model for Integrating Sustainability in Projects and Project Management. 24th World Congress of the Int ernational Project Management Association (IPMA). Istanbul. Society for Ecological Restoration, S. a. (2002). The SER primer on ecological restoration Retrieved July 15, 2017, from www.ser.org Staats, E. (2016, January). Chinese billionaire Wenliang Wang has agreed to donate money for long delayed resoration of dying mangroves Retrieved from Naples Daily News: http://marcomangroves.com/images/NDN2016.01.12.pdf The World Bank. (1996). The World Bank Participation Sourcebook. Washington, D. C.: The World Ba nk. Ward, R. D., Friess, D. A., Day, R. H., & MacKenzie, R. A. (2016). Impacts of climate change on mangrove ecosystems: a region by region overview. Ecosystem Health and Sustainability Wyant, J., Meganck, R., & Ham, S. (1995). A Planning and Decision Mak ing Framework for Ecological Restoration. Environmental Management 789 796. Zysko, D. P., Evans, J. R., & Lewis III, R. R. (n.d.). Fruit Farm Creek Mangrove Restoration Retrieved from http://www.marcomangroves.com/images/plan.PDF Zysko, D. P., Worley, K. Lewis III, R. R., & Flynn, L. L. (2015). Fruit Farm Creek Mangrove Restoration Phase 1A Time Zero + 36 Months Monitoring Report. The Ecology Group, Inc.
92 BIOGRAPHICAL SKETCH As a transfer student, Kristin started her schooling at the University of Florida in the College of Design, Construction and Planning b y receiving her Bachelor of Science in Sustainability and the Buil t Environment. Following that, she g raduated as a Master of Urban and Regional Planning While attendin g school, she worked at the U.S. Geological Survey, which inspired the topic for this thesis. Working at USGS p rovided Kristin with an invaluable experience learning about mangrove restoration an d the planning it takes to successfully complete an ecological restoration project. Throughout her master s schooling Kristin was involved in a number of emergency management projects. She was a part of a team of UF students tasked with auditing Manatee County s Post Disaster Redevelopment Plan (PDRP). She i s also participating in a project developed to document the informal emergency management processes for the City of Cedar Key. For this project, she presented preliminary findings at the Sierra Club s Cedar Key Climate Conference.